If you missed my earlier post, I’ll let you in on something special. Since my kiddos were young, each year I have told them we will have small family celebrations on their birthday… until they turn five. And then at five years old, ten years old and fifteen years old, they are allowed to have a few friends come celebrate with them. So as my daughter turning five isn’t already a BIG deal, now she gets her FIRST ever friend party!! This is big stuff in our house. 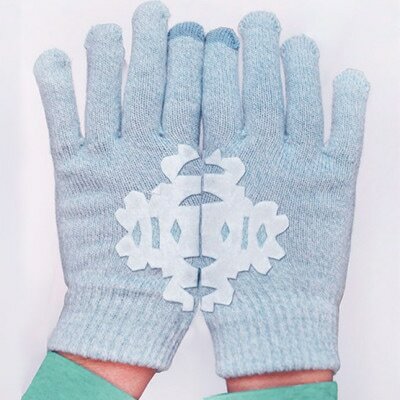 You can go any direction you would like to with this easy DIY. 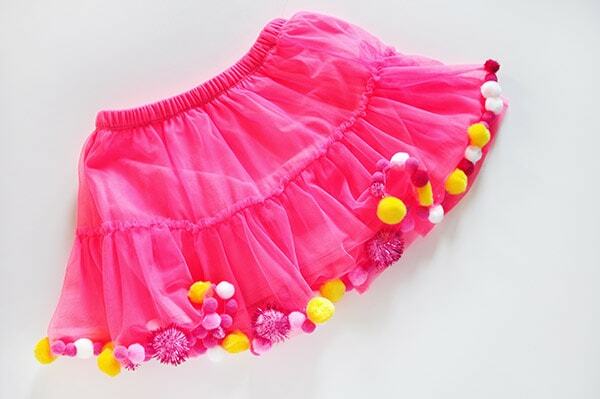 I’m kind of an order gal, so I put my pom poms in a colorful pattern before I started securing them to the skirt. 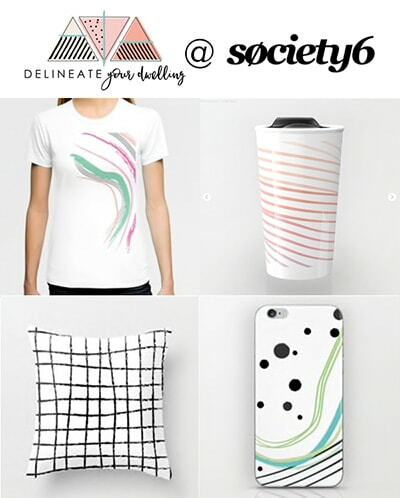 However, it would be just as fun to mix up the colors in a random fashion. 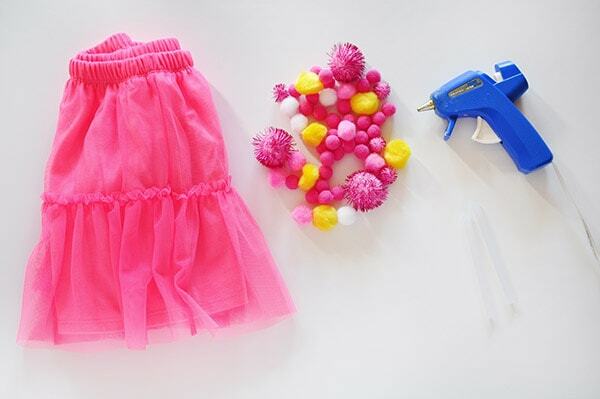 Then, you simply adhere each pom pom to the outer layer of the skirt with your glue gun. 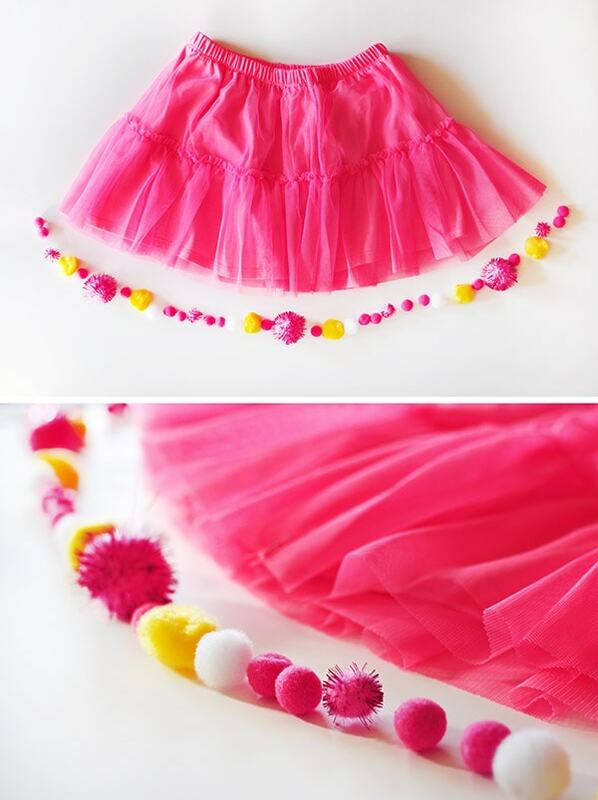 I did notice that you need to keep the pom pom spacing fairly close or they visually separate when the skirt is worn. 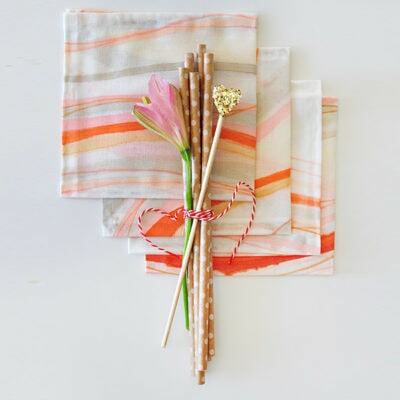 Although there are a lot of pom poms to add, this project actually took under an hour. For the cost and time involved for this project, it’s going to be the perfect little addition to make my birthday girl feel special at her pom pom party. And just in case you were wondering…. 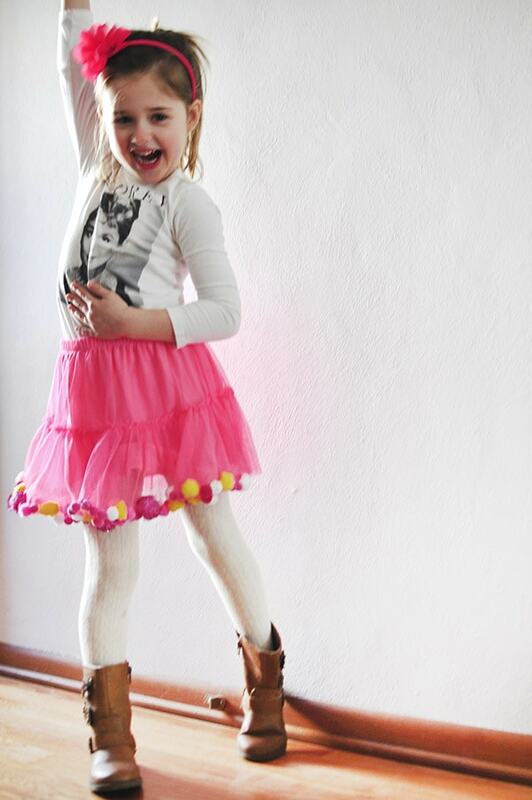 she’s PRETTY excited to wear this pom pom skirt! 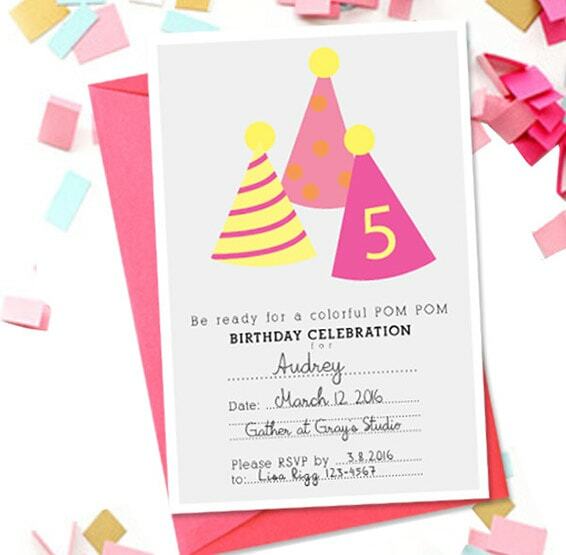 And be sure to check out the adorable FREE Printable Pom Pom Party invites. 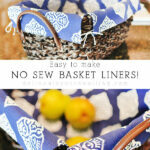 Very cute and very easy! My type of project! My kind of project, too Lara! Thanks for stopping by today. 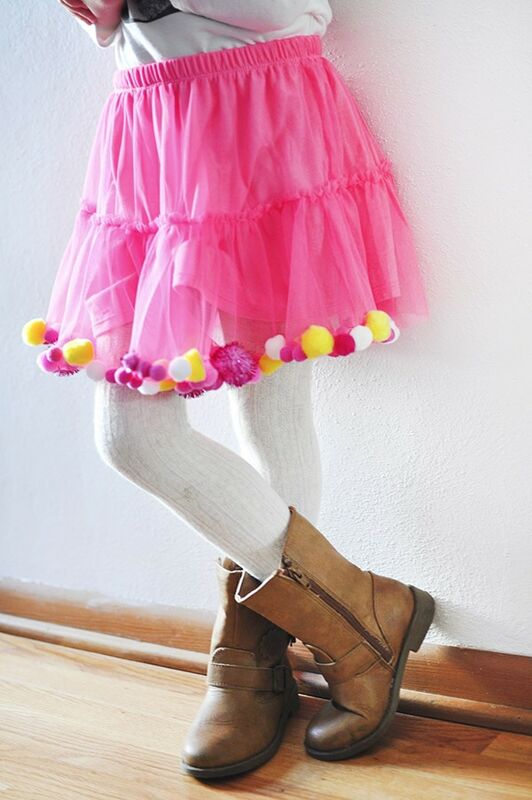 My 5 year old granddaughter would love that skirt! 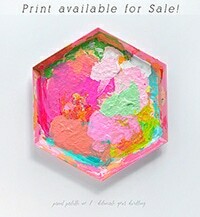 What a good idea, thank you for sharing it on the link party. My daughter is five and she LOVES it! So, I’m sure your granddaughter would love it, too! 😉 Thanks for stopping by today. Super cute! My 6 year old would love this. Visiting from Tutorials and Tips party. 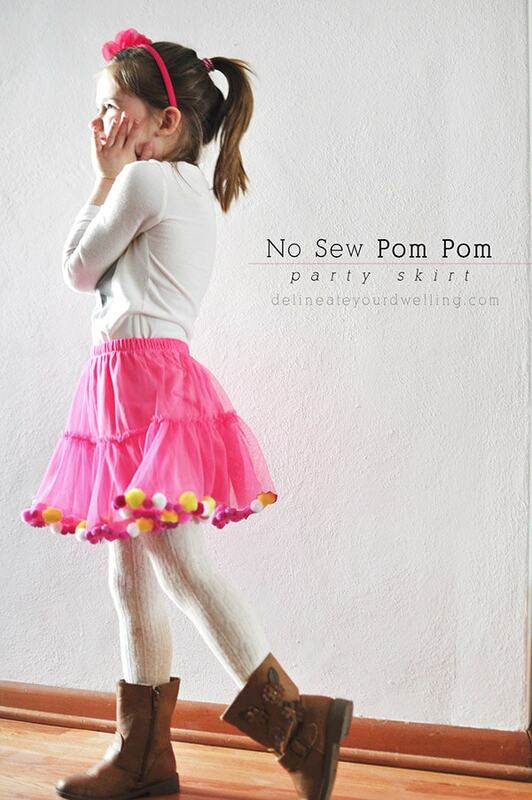 Who wouldn’t want a pom pom skirt? I almost want to make one for myself, ha! 😉 Thanks for stopping by. Thanks girl. My daughter is OVER THE MOON about it!